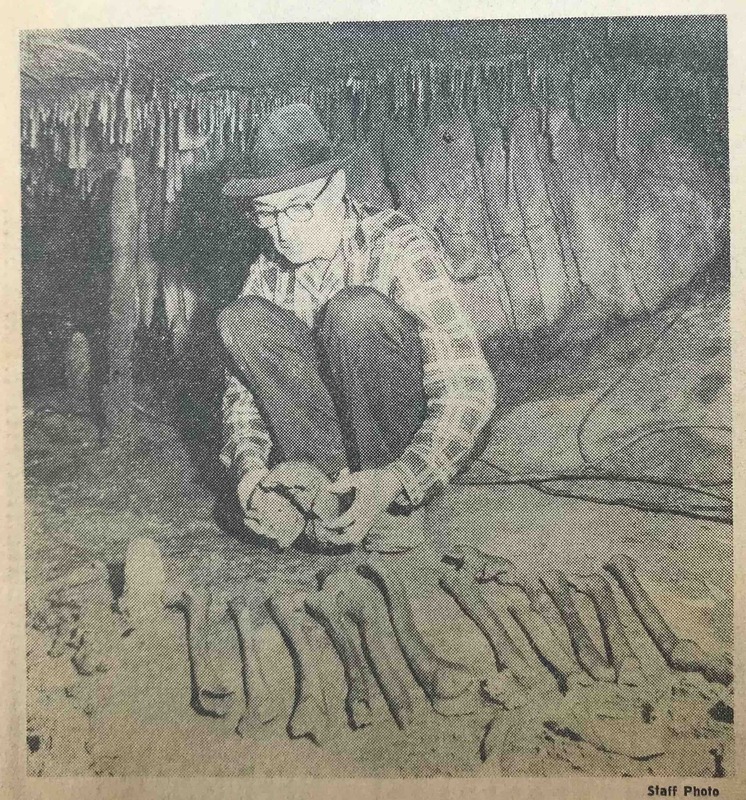 Cleon Turner and some of the human bones he found in Crystal Onyx Cave. Cave City, KY. “Look over here.” Says Cleon Turner, “and you can see what those birds did.” Turner, a slight agile man wearing mud-caked coveralls, points to what looks like a well of rocks piled deep inside his best cave. “Those birds” is turner’s favorite phrase for an ancient tribe of Indians whose remains he has found in the cave. He is working to prove his theory that the Indians sealed off chambers filled with relics of their primitive culture. The effort involves squeeing through damp, unexplored passages and hacking rocks from cramped, muddy crevices. But it is a familiar pastime for Turner. Born 56 years ago in the heart of the Barren County cave region, he has been a “caver” most of his life. He maintains, in fact that he is the only genuine caver in the South Kentucky hills. Other cave hunters are active in the area, selling onyx marble and other souvenirs to the gift shops that thrive on Mammoth Cave tourist traffic. But Turner says that the others merely look for caves that have natural openings. He finds his caves by digging for them. Turner, who works as a carpenter when he isn’t “caving,” estimates that he has found and explored more than 400 caverns in Barren, Hart, Edmonson, Warren and Monroe counties. He says that he begins by looking for such clues as “yellow limestone, red clay and cedar.” Then he finds a swag or sinkhole and starts digging. The cave, if one is there usually will be uncovered three or four feet from the surface, he says. Getting to the floor of a cave sometimes involvers sliding 100 feet or more down a cable. But Turner, who lives with his family in Cave City, says that he has never had an accident or run into trouble. Turner’s affinity for caves dates from his boyhood when he worked a a guide in a commercial cave on his father’s farm not far from Mammoth Cave. One of his co-workers, he recalls, was Andrew Lee Collins, brother of Floyd Collins, whose fatal ordeal in Sand Cave drew national attention 41 years ago. Turner managed to find half a dozen smaller caves on the family farm. Soon he was exploring whenever he could make an arrangement to keep half of any souvenirs he might find. The cave in which Turner is working, Crystal Onyx, is the first that he has opened commercially. When he and a companion first lowered themselves into the cave in 1960, they landed on an Indian burial mound. A University of Kentucky anthropologist, Dr. Douglas W. Schwartz, found that the mound was unusual and that the Indians – like some others known to have lived in the area – may have been prehistoric. Since then, Turner has come to the conclusion that the Indians lived and buried most of their dead in other parts of the cave, which they finally sealed with rocks. His approach may not be scientific, but Turner says that he’s not going to stop digging until he finds out for sure what “those birds” did.